Fiction – paperback; Penguin Modern Classics; 150 pages; 2000. If you have ever read Charlotte Brontë’s Jane Eyre, you will know that Jane falls in love with Edward Rochester, an ugly man with a mysterious past, whose wife has gone mad and is locked away. What you don’t know is how he came to marry his wife, Bertha Mason, and what made her so unwell. That’s where Jean Rhys steps up to the mark. Rhys effectively writes the prequel to Jane Eyre by telling the story of Bertha’s early years in Jamaica. She renames her Antoinette Cosway and explains how she came to marry an Englishman, who later takes her back to his homeland, where she was driven towards madness. Of course, you don’t need to have read Jane Eyre to appreciate Wide Sargasso Sea, but it does vaguely help to at least know a little of the storyline. 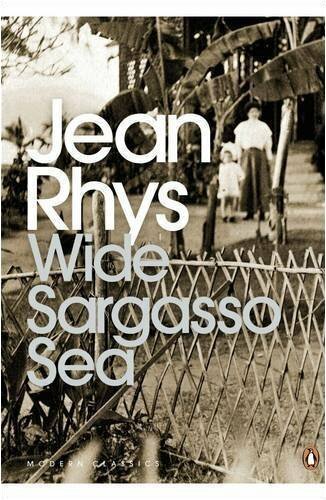 Wide Sargasso Sea is widely regarded as Jean Rhys’ masterpiece. She was 76 when it was first published in 1966 and had fallen into obscurity. I know of her largely through her early novels written in the 1920s and 30s, and can highly recommend Quartet and Voyage in the Dark — both of which are heart-breaking, full of melancholy and decades ahead of their time. I was expecting more of the same here, but found the book very different in tone and style. It is divided into three parts. The first is essentially about Antoinette’s troubled childhood growing up in Jamaica in the early 19th century as a poor white Creole surrounded by richer natives, who looked down their noses at her family and called her a “white cockroach”. Violence, prejudice and madness abounds. The first-person narrative is oblique and often confusing, and there are so many characters it is hard to get a handle on who is who. The second part is far more entertaining and has a definite page-turning quality. Antoinette is now a young lady who is about to be betrothed to an unnamed gentleman from England — and it is he who mainly tells their story. The pair spend their honeymoon holed up in a remote house surrounded by lush jungle, with just themselves and their servants for company. Initially their relationship is cold and distant but then it thaws into something rather rabid and sexual. But when rumours about Antoinette begin to circulate via letter, her husband loses all interest — and takes up with one of the servants instead. The third and final part returns to a more oblique style of story-telling, and Antoinette takes up the narrative, this time from a locked room in a house in England, where she resides. It’s pretty easy to see why this book is regarded as a literary masterpiece and why it appears on so many school and university text lists. It is full of metaphors and symbolism and hidden meaning, and there’s a layer of subtext going on that needs to be excavated to fully appreciate. It’s also ripe with social mores, political intrigue and sexual oppression. Its Caribbean setting is also important, not simply because of the tropical landscape which harbours dark secrets, but because of the island’s troubled racial history. The Emancipation Act might have ended slavery, but Antoinette, a Creole heiress, feels caught between two races — the white Europeans and the black Jamaicans — and doesn’t like being judged by either group. There’s plenty of oppression here, both racial and sexual, and while the story deals with dark subject matter, it is short enough not to weigh the reader down. The characters — the cruel, cold-hearted, lust-driven husband; the independent, vivacious but troubled Antoinette; the loyal but opinionated Christophine, amongst others — are wonderfully realised and terrific company. And Rhys has such a way with language, particularly when it comes to describing the beguiling landscape, that Wide Sargasso Sea is a joy to read. I am a Jean Rhys fan and started with this one. It is not my favourite by any means–although I think it was very successful in slotting into the Jane Eyre story. The film is excellent too, if interested. I think she’s fabulous. This one is very good, but so completely different to her earlier novels, which I thought were extraordinary. I remember reading Voyage in the Dark quite a few years back and being absolutely devastated by it. Didn’t know about the film of Wide Sargasso Sea — I’m not much of a film person — but will look into it. I read this years ago (about 19 years ago) after it was recommended to me by an older friend who found out that I loved Jane Eyre and all the Brontes. I have to say, it didn’t make much of an impression on me at 18, but I think I was too young for it. Until I’d read your review, I couldn’t really tell you what happened in the book. Time for a re-read, I think. Thanks, Kim. Man, that review would have been useful when I was trying to pick my way through the first half at school. I found it hard to follow too – although for me the winding, distracted quality got enmeshed with the idea of the repressive heat in the Caribbean, so I actually found it quite effective in the end. Definitely makes you ask a lot of hard questions of Jane Eyre. Weirdly I’d been thinking about this novel recently, as I was looking at novels that take their main character from an existing novel. Wide Sargasso Sea was all I could come up with – there are plenty of novels about authors, but apparently very few successful ones about somebody else’s character. Or maybe I’m missing something glaringly obvious? I’ve bought this (but not yet read it) solely based on my love for Jane Eyre. Good to know she’s written some other books too that I can read! The ‘Jane Eyre’ angle is one reason why I’ve been hesitant to try this. Admittedly, it’s probably not up there with ‘Pride and Prejudice and Zombies’, but it does still seem a little like tampering with another writer’s work – or is that not the case? I have the vaguest feeling of having read it at school, but don’t recall any of the story. I think you probably have to be a certain age to appreciate it. Rhys doesn’t spell things out. In many cases you have to join the dots. I suspect you’d appreciate it a lot more now. In any case, I’d probably recommend her back catalogue above this one. Oh no, it’s not tampering at all. Basically Jane Eyre is inspiration for this book — I believe Rhys had read Jane Eyre and was puzzled by Rochester’s wife getting such a bum deal — why was she so mad and locked away? So, she kind of imagines what made her that way and tells her side of the story. To be honest, you don’t need to have read Jane Eyre at all — it’s a completely standalone read — but I do think you get a richer experience knowing the storyline. The top of your head is a LOT more useful than mine. Actually, I had heard of Scarlett before, but in such scathing terms I didn’t even think of it! But March and Rebecca are a revelation – March looks great, and I’m a bit shamefaced not to have heard of it! Have you read any of them? Anyway, thanks for those gems! I think what I most admired about this book was the fact that it works as a wonderful companion piece to the wonderful Jane Eyre, but it also stands alone and is a fantastic book in its own right. I found it gripping and loved how the heat seemed to make the madness and the lustful nature of the book all the more vivid. I have meant to read more of her novels and haven’t, so thank you for the reminder as I will very soon.